90 again? When is REAL fall coming?? We've had a few tastes of fall in the past month, but between those, warm days have left many of you wondering "when is fall here to stay?" We'll have another shot at it with a large-scale cold front that will move quickly through the region Thursday night. Prior to then, the Mid-South will be toasty the next couple of days. In addition, with southerly wind returning, humidity will also increase. Today's high of 90 could be matched tomorrow with enough sunshine, which I think is a good possibility. With increasing clouds and southerly wind Wednesday night, lows will remain above 70, but those clouds and a chance of thunderstorms Thursday afternoon will hold temperatures in the upper 80s. On Thursday night, a cold front will sweep through the region, bringing showers and thunderstorms area-wide. The severe weather threat is low with this system, but not non-existent, particularly in Arkansas. This time of year, instability is typically the wild card in potential severe weather scenarios. The dynamics (for instance, upper level wind energy) associated with these systems tend to get stronger as the fronts get stronger in the transitional seasons. However, without instability (the gasoline that causes the fire to explode), strong storms have a harder time becoming severe. 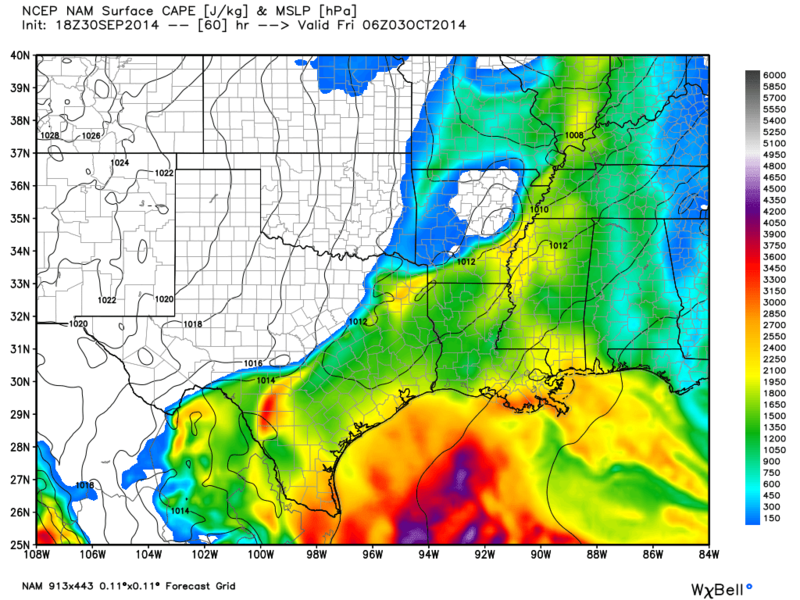 Forecast instability, as measured by CAPE, at 1am Friday morning as the probability of storms increases. Values are more than sufficient for thunderstorms, but the severe weather threat is fairly low. Graphic courtesy WeatherBell. The timing of Thursday's storms will be during the overnight hours when instability (brought about by heating of the atmosphere) will be lower than during the afternoon hours when the sun is high (but still at moderate levels). Therefore, while a marginal damaging wind threat is possible, the best scenario for severe storms will be to our west where the storms will be during peak heating. Rainfall amounts could reach an inch or more Thursday night, but widespread flooding is not expected either. "Forecast radar" from the mid-day run of the NAM model valid at times indicated. This is an early indication of timing and is NOT a forecast of exactly what will occur. Note the general decrease in line strength between the two images. Graphic courtesy WeatherBell. The storm system will likely be gone by the time you head to work or take the kids to school on Friday morning. 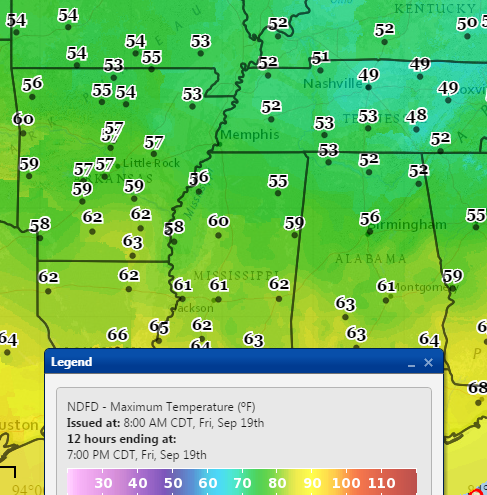 Behind it, a much cooler airmass overtakes the Mid-South. Skies will quickly clear and, even with lows in the mid to upper 60s Friday morning, mid 70s may be as high as we go in the afternoon. The weekend looks simply stunning! Some outlying areas may see lows in the 40s with highs in the 70s across the board. A great weekend to get out and enjoy fall in the Mid-South! 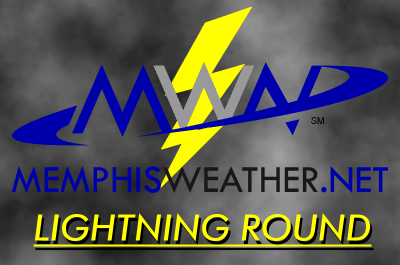 The MWN Lightning Round is back with three topics for this fabulous fall Friday! 1. First, and most important, the weekend forecast! Lots of activities again going on around town this weekend as fall gets into full swing. The weather will cooperate for most of them, but it will be warm with slightly increased humidity levels. For today, high clouds will stream overhead but no rain is expected and temps will reach the mid 80s, similar to yesterday. Friday night football looks great with temps near 80 at sunset and a light northeast breeze. For Saturday, another day not unlike the last couple. Clouds will be a bit thicker, but the rain chance is still very low and not worth worrying about. Temps will once again reach the mid 80s, but morning lows will be a bit higher (mid 60s) as humidity increases. If you're headed to Oxford for the Memphis-Ole Miss football game, expect cloudy skies, a slight rain chance, and temps near 80 at kickoff. A developing trough to our south is responsible for the clouds this weekend. As it moves northeast into the southeastern U.S., rain chances also go up a bit for us, mainly Sunday. Earlier this week, some models were hinting at a Sunday washout but that does not appear to be the case now. Scattered showers are expected though and will be more numerous to our southeast, over northeast MS into AL. Temps will be a few degrees cooler Sunday due to the showers in the area. A warm and dry pattern sets up for next week until another true fall cold front moves in by week's end. 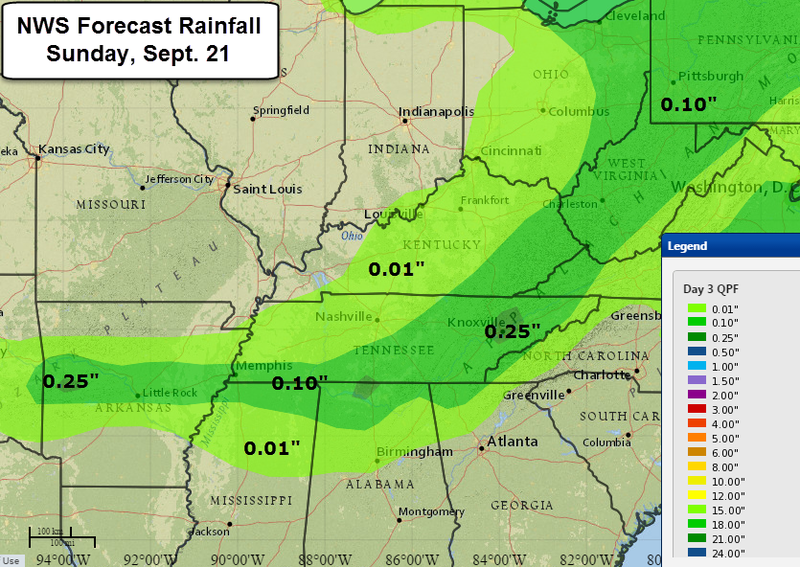 Weekend rainfall forecast from the NWS. Precip (mainly Sunday) could average 0.10" in the metro with heavier amounts to the southeast. Graphic courtesy NOAA/NWS/WPC. 2. 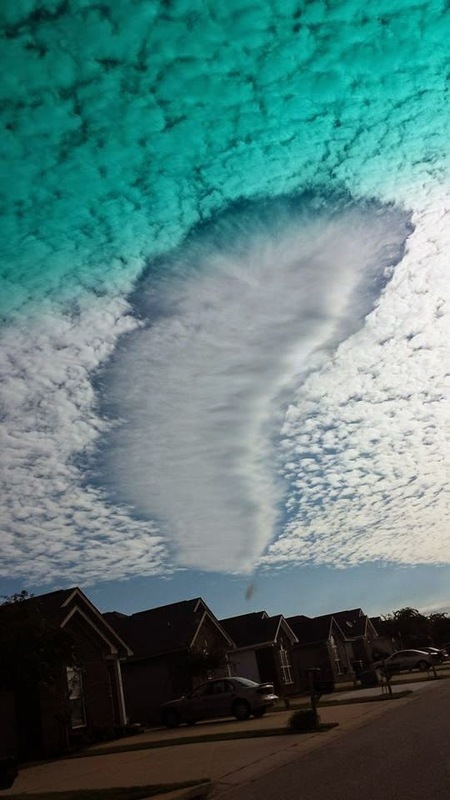 A unique cloud formation was observed over the Tuscaloosa, AL region this morning. A "hole punch" cloud, or fallstreak hole, caught the eye of a bunch of smartphone-toting folks, who captured pictures of the event. An example, from the Twitter feed of James Spann, is shown below. Hole punch clouds are typically formed when aircraft fly through an area of supercooled water droplets. In the aircraft's wake, rapid cooling takes place and introduces ice crystals into the air, causing the water droplets to evaporate. This leaves a hole in the cloud and ice crystals below it! For more on hole punch clouds, including some cool pics, see articles from the Cloud Appreciation Society and Wikipedia. Fallstreak cloud over Tuscaloosa, courtesy James Spann on Twitter (@spann). 3. The National Weather Service is officially joining Twitter! OK, so many NWS offices have been there for some time, but as with any new product or service from the NWS, there is an "experimental" phase in which they test the waters and solicit feedback. As of October 31, their use of the service becomes "operational," meaning NWS offices are expected to utilize the medium for information sharing. There literally is no faster way to share and receive information than Twitter. Breaking news almost always breaks there first these days. While the use of Twitter will be a "complementary" service at the NWS, they expect to "disseminate important information about hazardous weather conditions" and Twitter "will also be used for public outreach and education and to direct users to official NWS Web sites." The NWS stresses that users should not rely on their Twitter feeds for warning information. To this point, the NWS has not indicated if or when their experimental use of Facebook will become operational. You already know that you can follow MemphisWeather.net on Twitter and Facebook (links below), but did you know that we have automated feeds of severe weather watches and warnings for each metro county on Twitter? Learn more and find your county's feed here. Hope everyone has a great weekend! We'll be watching for our next big fall front late next week. In Shelby County, there are five entities responsible for outdoor warning sirens to alert the populace that a Tornado Warning has been issued for Shelby County. 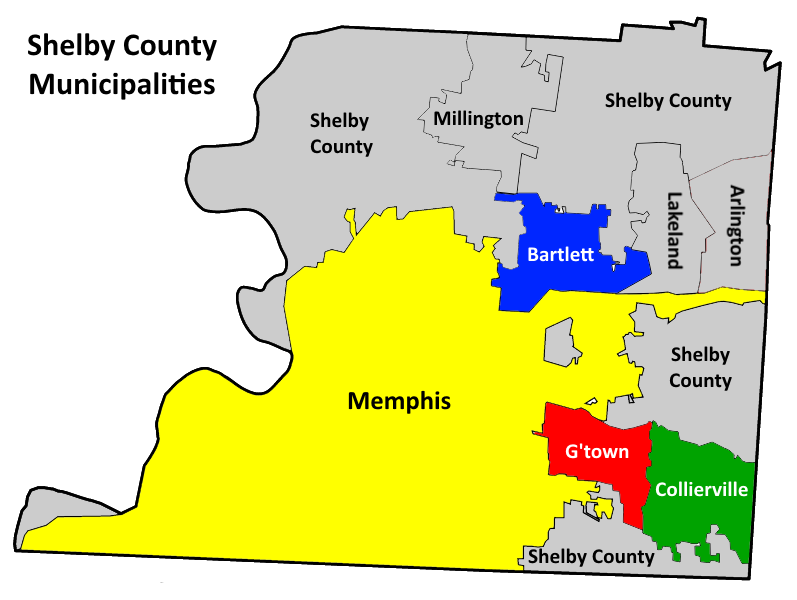 Those are the cities of Memphis, Collierville, Bartlett, and Germantown, plus Shelby County. Each of the four cities are responsible for warning systems within their municipal jurisdiction, while the Shelby County Emergency Management Agency covers unincorporated Shelby County outside the aforementioned 4 cities, plus the towns of Arlington, Lakeland, and Millington. Municipal boundaries within Shelby County. Bartlett, Germantown, Collierville, and Memphis all activate their own outdoor warning sirens. Shelby County is responsible outdoor sirens in unincorporated areas, as well as Millington, Lakeland, and Arlington city limits (grey). As has been discussed on this blog before, Bartlett, Germantown, and Collierville all sound their outdoor sirens based on an imminent threat to their particular municipality, using the Tornado Warning polygon (or warmed area) issued by the National Weather Service. The city of Memphis and Shelby County have warned their entire area of responsibility for a Tornado Warning that includes any part of Shelby County. That policy will be changing in the city of Memphis. 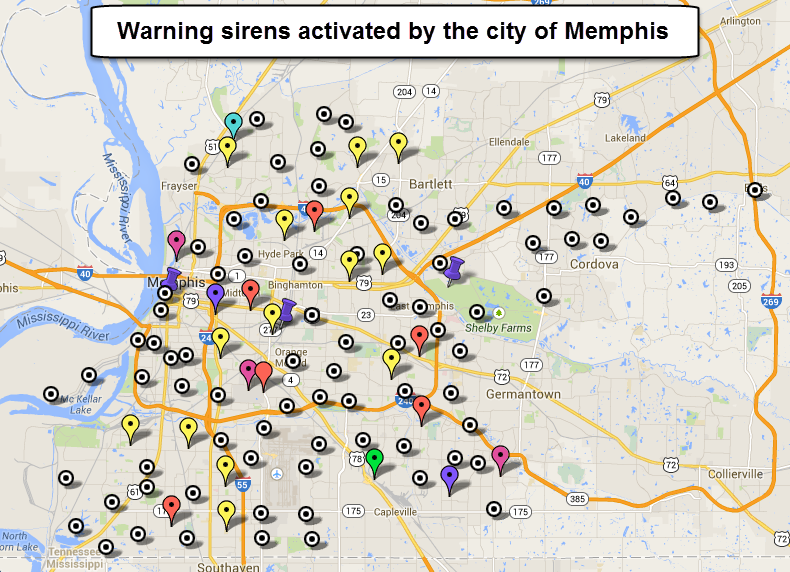 Location of the city of Memphis' outdoor warning sirens on Google Maps. So how will the new system work? The software will ingest weather alerts as soon as they are issued by NWS-Memphis. When a Tornado Warning is issued that intersects any part of the city of Memphis, sirens will be automatically activated by the software. The sirens that sound will be those within the NWS polygon/warned area, as well as those that can be heard within a portion of the warned area, even if they are outside of the warned area. This "buffer" will mean that some areas that are just outside the warned area could hear the sirens, but it will significantly cut down on the overwarning of the entire population when a small section of the city is affected. In addition to the software-driven activation, sirens can also be sounded (in whole or in part) manually. All activities of the system are also logged and displayed on the user interface so that key personnel will know when and which sirens activated and whether each siren is in a functional state. The approach taken by Memphis is a bit different from those in Bartlett, Collierville, and Germantown. In the new Memphis system, parts of the city may be warned, while other areas are not, due to the large geographic area within the city limits. In the other three municipalities, the entire municipality is alerted if any part of their city limits are within the warned area. This approach, while it may still result in some overwarning, is certainly satisfactory given the smaller geographic area that these cities cover. At this time, we are unaware of any planned modifications to the Shelby County policy, which warns all of their area of responsibility for any threat to the county (meaning a Tornado Warning for Collierville would result in sirens sounding countywide). Shelby County is responsible for sounding sirens for areas outside Memphis, Bartlett, Collierville, and Germantown, including Arlington, Lakeland, and Millington. I am strongly in favor of the more modern, and conservative, approach to warning that is now being developed by Memphis and is in place in the other three municipalities. It has been nearly 7 years since the National Weather Service transitioned from county-based warnings to storm-based polygon warnings for Tornado, Severe Thunderstorm, and Flash Flood Warnings. The goal was to offer more clarity on areas the storm would affect and warn fewer people, only those most likely to be in harm's way. Autumn officially arrives with fall-like weather! After a weekend that felt like late summer to many, with highs near 90 and humidity a bit above the "comfortable" level, we're basking the wake of a fall cold front today! High temps are remaining in the 70s and dewpoints are hovering around 50 on a north breeze, leading to a very comfortable afternoon. Noon Central temperatures. 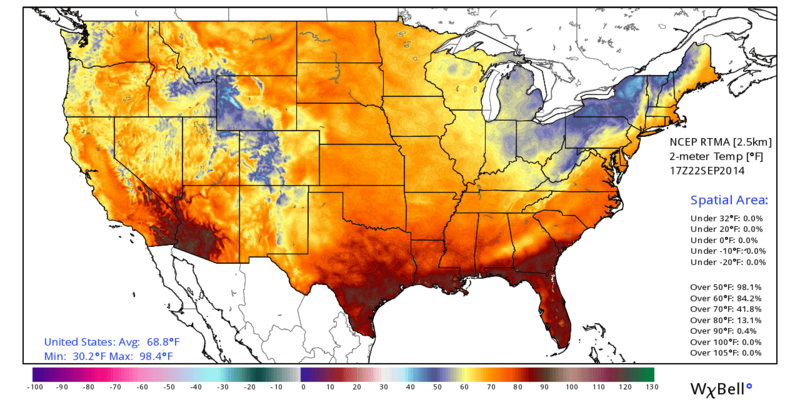 Notice the 80s have been shoved well south by yesterday's cold front, with only 13% of the country above 80 degrees. There are even 50s in the northeastern U.S. at early afternoon. Graphic courtesy WeatherBell. 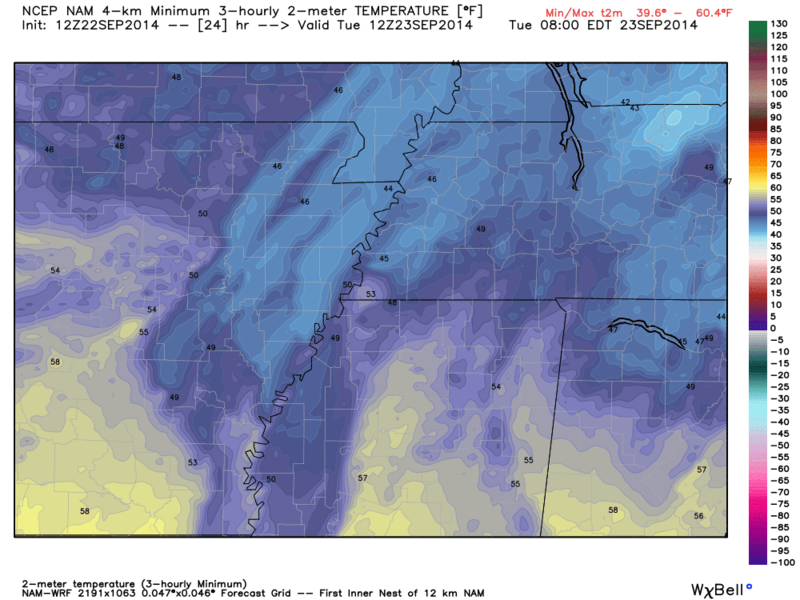 Tuesday morning's lows will be near 50 outside the city center, but the NAM model indicates some 40s in outlying areas north and east of Memphis. Graphic courtesy WeatherBell. Yep, that's a lot of 40s across the region! 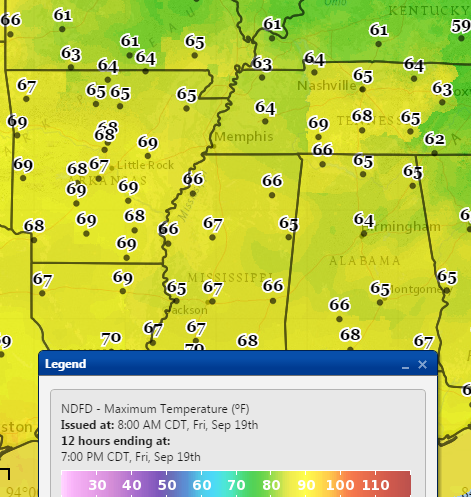 While the urban heat island known as the Bluff City and north MS will stay in the 50s, outlying areas of the metro to the north and east might just see the first upper 40s readings of the fall! Mmm-hmmm.... that's how I feel too, Cosby. So how long will it last? The MWN Forecast says tomorrow's high of 78 will be the last 70s reading for several days, though humidity will remain low through the rest of the week. Expect dry conditions and highs in the lower to mid 80s Wednesday through Saturday. By the end of the weekend into early next week, we're watching for the possible development of a Gulf low which moves into the southeastern states. Models disagree on the effects locally, but we'll let you know what to expect when we do! I promised that summer was over with our last big cold front. I still maintain that, though it'll get within a few degrees of my "summer threshold" this weekend ahead of another cold front that moves through Sunday! There are a lot of outdoor activities this weekend, including the Memphis Tigers football game Saturday evening vs. MTSU (Go Tigers! ), the start of the Mid-South Fair at the Landers Center in DeSot County, and the 3rd annual Best Memphis Burger Fest at Minglewood Hall among others. Normally mid-September highs are in the mid 80s and lows in the mid 60s. A warm airmass ahead of the cold front will mean temps slightly above average. In fact, we could push 90 degrees Saturday afternoon with upper 80s on Sunday as the front moves through the region. Humidity levels will also be elevated with dewpoints in the mid 60s, but not quite to the "summer" threshold. Dewpoints this evening are high enough to notice some humidity in the air. The cold front Sunday will bring a chance of afternoon thunderstorms, but right now we put that rain chance at just 30%. No severe weather is expected and it should not deter you from carrying on with your plans. You might just keep an umbrella close by in case a passing storm moves overhead! Average rainfall expected on Sunday as the front moves through. Scattered t'storms are expected mainly in the afternoon. By Monday, cooler and drier air seeps in with dewpoints falling into the comfortable range in the 50s, mostly sunny skies, and highs near 80. The rest of next week looks mighty fine with abundant sunshine through at least Thursday, highs in the low to mid 80s and lows generally in the 60s, though many areas will see upper 50s on Tuesday morning. Dewpoints on Monday evening are much more comfortable behind the front. While most readers of this blog have clear memories of 9/11/2001, many of you will now remember 9/11/2014 for some time to come as well. The flooding that took place today may be as bad as some of you have witnessed, or at least rank in the top couple of events that you have personally experienced. As storms well to our north moved towards the region overnight, an outflow boundary moved slowly into the metro from north to south. Behind it, storms rapidly fired on a southerly low level jet stream and plenty of warm, moist air. The storms moved east, but continued to fire behind the outflow, resulting in a "training" effect. Storms fired near the Mississippi River repeatedly and moved east across Tipton, then Shelby and Fayette, and finally DeSoto Counties. The hardest hit area during a couple hour period during rush hour was a stretch from Frayser to Raleigh to Bartlett. Later, during the mid-morning hours, DeSoto County, particularly the center of the county near I-55, saw repeated storms. Rainfall totals of 6-10" were found in these corridors, though widespread 2-5" readings were found throughout the metro. 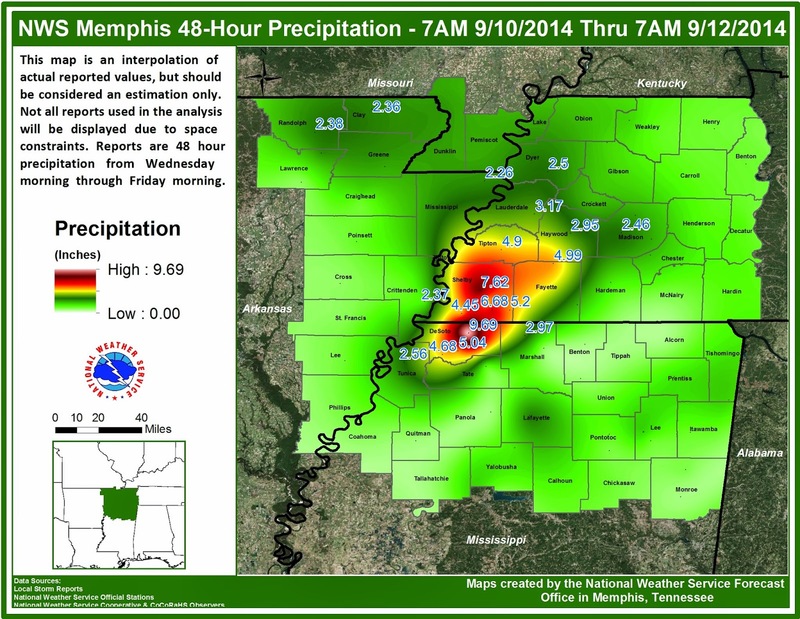 48 hour precip totals for the event with most of the rain falling the morning of the 11th. Click for larger image. Below you'll find a video loop of the NWS Doppler Radar from 4am until noon. Feel free to play it a couple of times and watch the storms fire behind a southbound "front" (outflow boundary) and train over the same areas. Hopefully you have a story of your own to tell without having been harmed in some way by the power of Mother Nature. I think I'll remember this one for a LONG time to come! Despite a very late start, summer did end up rearing its ugly 3-H head (hazy, hot, and humid) the past few weeks. Though there were a few brief respites in August, the end of last week into the first half of the weekend did me in. I am over the heat and especially the humidity. We are now in the midst of a short respite from the humidity, but temperatures are already rebounding behind Saturday's cold front and humidity will also make a return tomorrow, and especially Wednesday. As highs reach back into the 90s those days, we'll see the heat index back near 100 on Wednesday afternoon. HOWEVER, I'm now highly confident, perhaps even giddy (much like a Memphis Tiger football fan after a very solid moral victory), that a season-ending cold front will kick summer to the curb later this week. A strong autumn front will dive south this week, passing through the Mid-South on Thursday. By this weekend, high pressure originating in Canada will dominate the U.S. from the Rockies to the east coast. The first freezing temperatures of the season will be found in the northern U.S. Snow will fall in the northern Rockies. And fall will begin! If you don't have outdoor plans this weekend, make them. 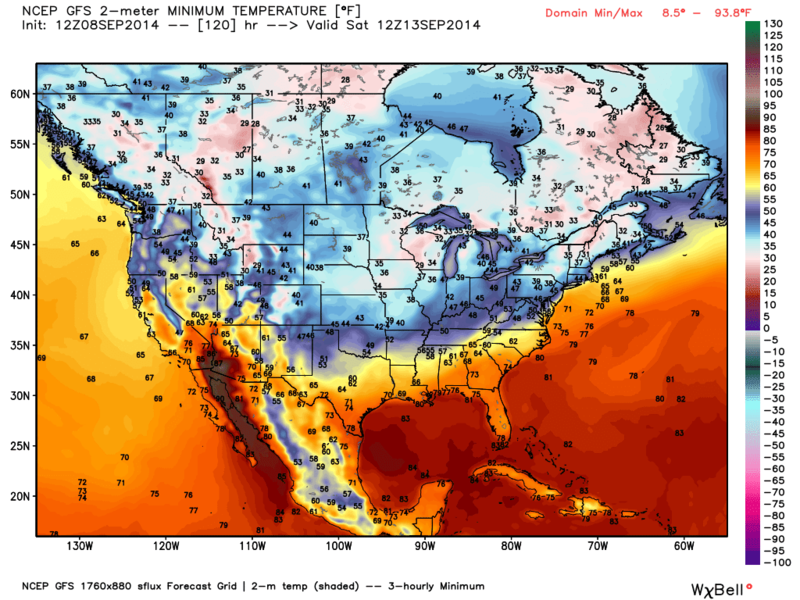 Saturday morning's projected low temperatures according to the GFS computer model. These numbers are backed up by the European model as well. 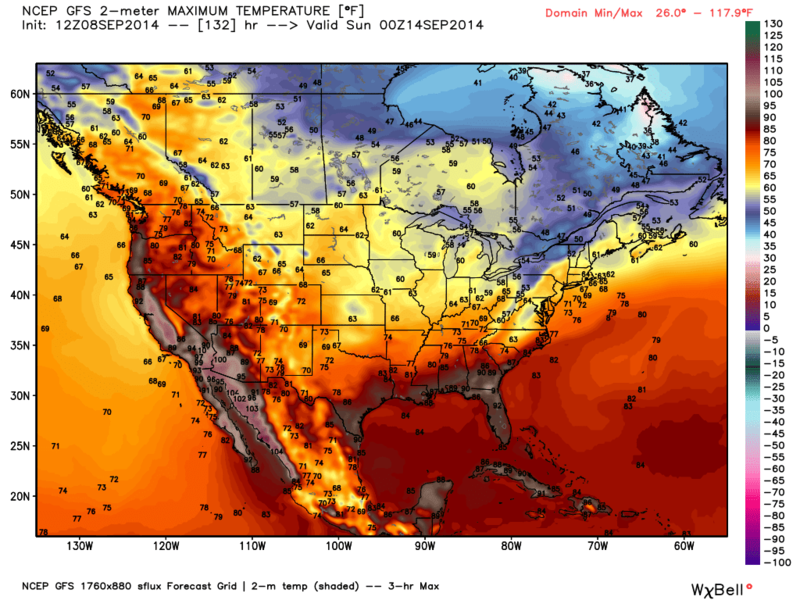 Saturday's projected high temperatures according to the GFS computer model. With a front of this magnitude, it's worth considering the possibility of severe weather, especially considering we go from a heat index near 100 Wednesday to lows near 60 less than 48 hours later. In this case, the passage of the front appears to be early in the day on Thursday, which is not the best timing for a severe weather threat. 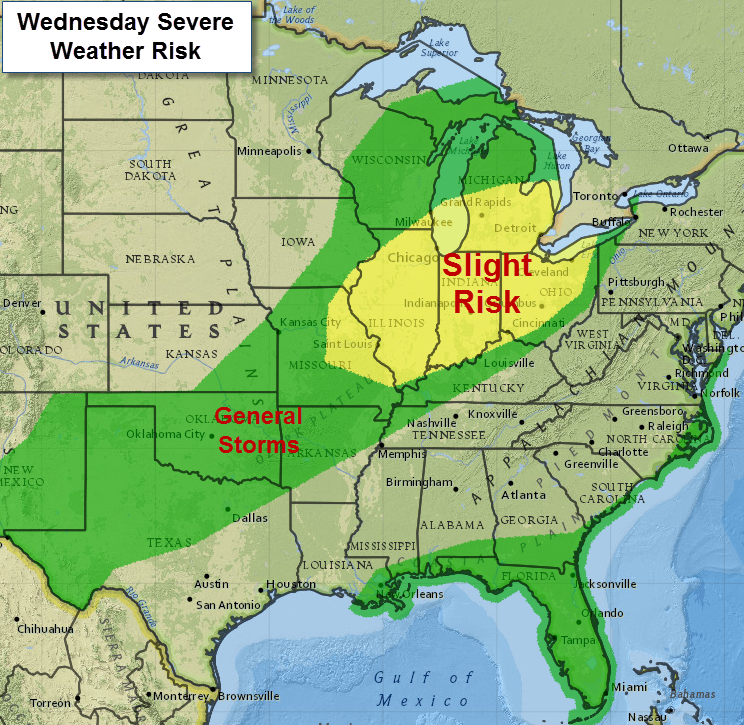 Also, with the main dynamics of the low pressure system going by to our north, that is where the main severe weather threat will be focused, as per the Storm Prediction Center severe weather risk for Wednesday shown below. By Thursday, thunderstorms are likely along the front, but severe weather is not expected, including here in the Mid-South. The fall cold front will bring a risk of severe weather to our north on Wednesday, but no severe weather is anticipated Thursday in the Mid-South. Beyond this week, the long-range outlooks favor near to below normal temperatures well into September. In fact, below normal temperatures are highly likely into the first half of next week according to NOAA's Climate Prediction Center, as shown below. By the time we start seeing any chance of above normal temperatures again (and I'm not predicting this), the average highs will be in the lower 80s. So while highs well into the 80s are still entirely possible, anything higher than that looks unlikely after this Wednesday. Thus my proclamation that with the arrival of this week's major cold front, summer is done - put a fork in it. Check out our forecast for the details on what I expect with the cold front, and more importantly, behind it. The NOAA temperature outlook for Sep 13-17 (Saturday through Wednesday) indicates well below average temperatures east of the Rockies, excluding the FL peninsula. For the Memphis area, there is a 70% chance that temps will average below normal. Average highs during this period are in the mid 80s and lows in the mid 60s. Are you ready for fall or do you wish summer could hold on a little longer? Through July, each month in 2014 had experienced below normal average temperatures. 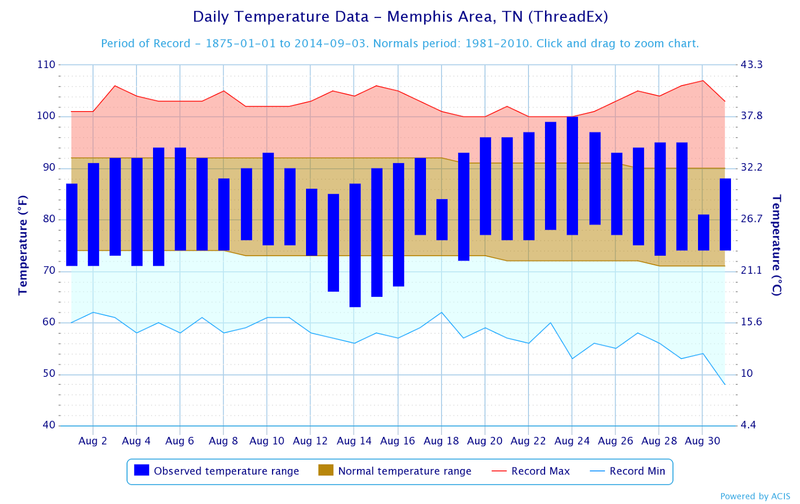 In fact, it had been 10 months since Memphis had an "above average" month temperature-wise. That streak ended with an average temperature for the month of August 0.5 degrees above normal. The highest temperature for the month (100, which tied a record high) was the first 100-degree reading in just over two years. Despite the slightly warmer than average month, the average temperature for the year through August ranks 22nd coolest on record (a span of 140 years). Precipitation-wise, the dry pattern from July continued into August. In fact, until the last two days of the month, the rainfall total for the month was less than 1", resulting in dry vegetation and browning Bermuda across the region! For the year, precipitation is still 124% of normal, or over 8" above normal. The only severe weather in August was wind damage in DeSoto County (Horn Lake) on the 24th from a downburst produced by a summer thunderstorm. For the period June-August, which is defined as "meteorological summer," temperatures were cooler than normal by 1.5 degrees (79.9 degree average) and precipitation was well above normal (17.76", +6.66" compared to normal) fueled by a record-breaking June. Average "meteorological summer" temps by year for all years on record for Memphis, TN. 2014 continued the downward trend of the past 3 year and was near climatological average. Records set or tied: Tied record high of 100 on the 24th and tied record high minimum of 79 on the 25th. Comments: 23 days had maximum temperatures at or above 90, four above the climatological average. The record high of 100 on the 24th was the first 100-degree reading in 25 months, last recorded on July 30, 2012 (101). For the year, the average temperature at Memphis is 62.5 degrees, which is 2.5 degrees below average. Comments: Zero days had more than 1" of rain and only one day recorded more than 0.50". As of the end of August, the yearly precipitation has been 43.72", which is 8.34" above (or 124% of) average. Daily August temperature readings (blue bars) overlaid on the normal temperatures (brown) with record highs (red) and lows (blue). Comments: 22 days had high temperatures at or above 90. The warmest low temperature was 77.6 on the 20th. Comments: 1.27" of the 1.49" recorded this month fell in the last 3 days of August. The 31st was the only day of the month with more than 1/2". Pop-up showers around mid-day today were a bit of a surprise, as they were not indicated by computer models early this morning and, according to our forecasts over the weekend, Labor Day appeared to be a dry day. However, an event currently not easily "forecast-able" by the models was the cause for these showers - a set of gravity waves! Sometimes these atmospheric waves can be detected in radar imagery, but if conditions are just right, they are more easily detected using visible satellite imagery, as was the case this morning. The image below, taken at 8:30am, shows an arc of clouds from OK through AR, into western TN and KY. This arc is the outflow boundary from the MO storms. However, the outflow was accompanied by a series of gravity waves as well, most clearly visible in OK in the circled region (the technical term for this phenomena is an undular bore). Click here for an animation of this satellite imagery clearly showing the waves propagating away from the storms between 7-10am CDT (animation download is large and recommended for high-speed internet users). Also, the waves can be faintly seen in this (large) radar loop from about 6am-10am this morning around Oklahoma City, Little Rock, and over east AR from the Memphis radar. An outflow boundary from decaying thunderstorms in KS/MO moved across OK, AR, TN, and KY this morning as shown in the satellite image taken at 8:30am. 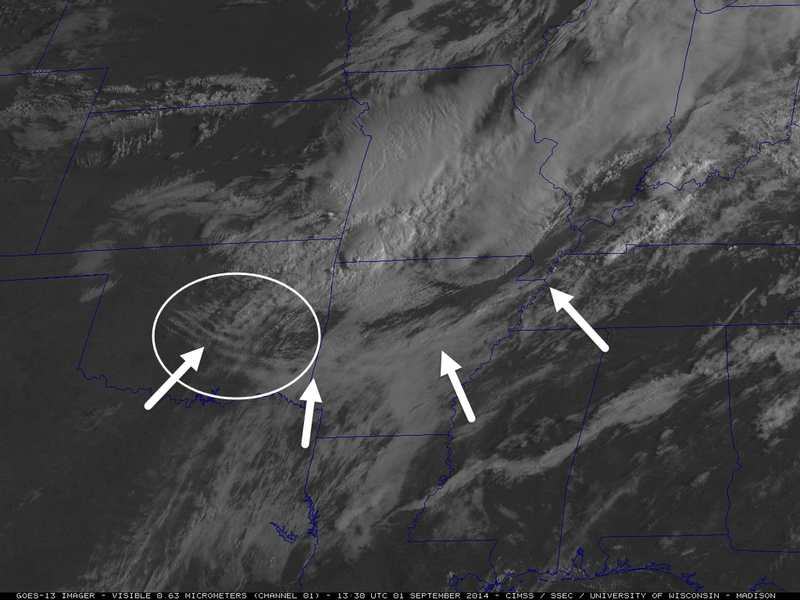 Gravity waves were also present behind this outflow, best seen in the circled area in OK. Click here for a satellite loop clearly showing the waves propagating away from the storm complex (Warning: VERY large animation - best with high-speed connections). So what conditions were responsible for the waves that occurred this morning and why did showers result in the Mid-South? 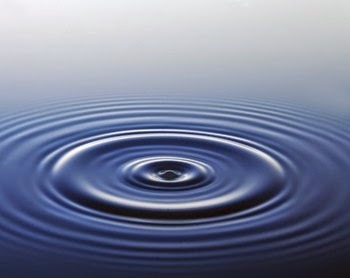 Just as when a pebble is thrown into a calm body of water, waves in the atmosphere spread out from a large disturbance such as a thunderstorm complex. In meteorology, these waves are called "gravity waves" and they form when the wave(s) are trapped in a stable layer of the atmosphere, rising like the crest of a wave on the water, then being pulled back towards earth by gravity. As long as the stable layer of air exists, the waves continue to propagate. The waves are visible on satellite imagery when they move through an area of saturated air that exists in or just below the stable layer. Rising air from the wave causes clouds to form in the saturated air and sinking air promotes drying or clear skies. The alternating rising and sinking air result in cloud bands that form perpendicular to the direction the wind is blowing at that level (transverse bands). Satellite imagery is the best way to see these bands of clouds that are the result of the gravity waves! The rising air from the waves can also be strong enough to promote precipitation from the resultant clouds, especially when they encounter less stable air, as was in place over the Mid-South at mid-day today. The showers were the result of the rising air in the gravity waves. Since we didn't know these waves would occur, nor that they would arrive as the atmosphere was destabilizing, we didn't have a good handle on the formation of showers either. As the waves dissipated, the showers ended by early afternoon.